i’m pretty stoked about the new bag i whipped up this weekend! 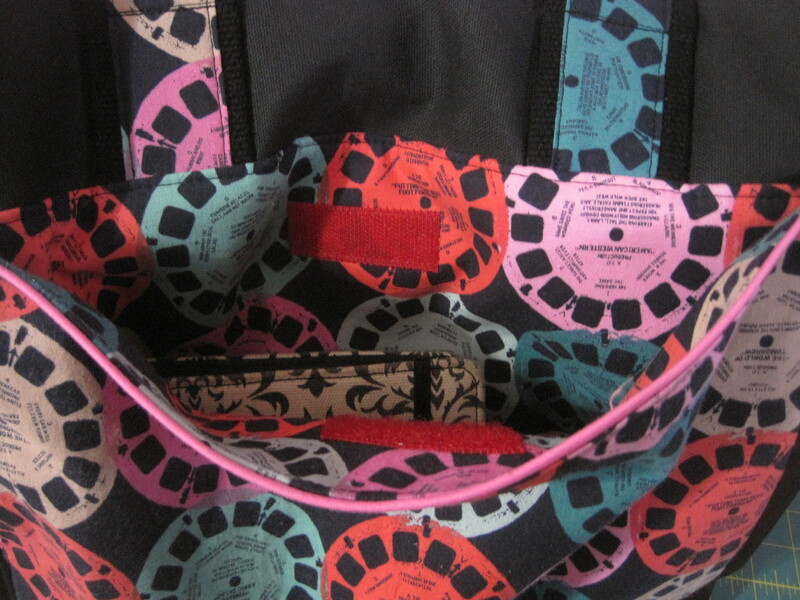 this is the noodlehead supertote, sewn up in melody miller’s viewfinder prints for cotton + steel. it’s kind of an unfortunate coincidence that the sample on the pattern envelope was also sewn in viewfinder print. i swear i wasn’t copying! i just have a trillion yards of this fabric, & i really like it. 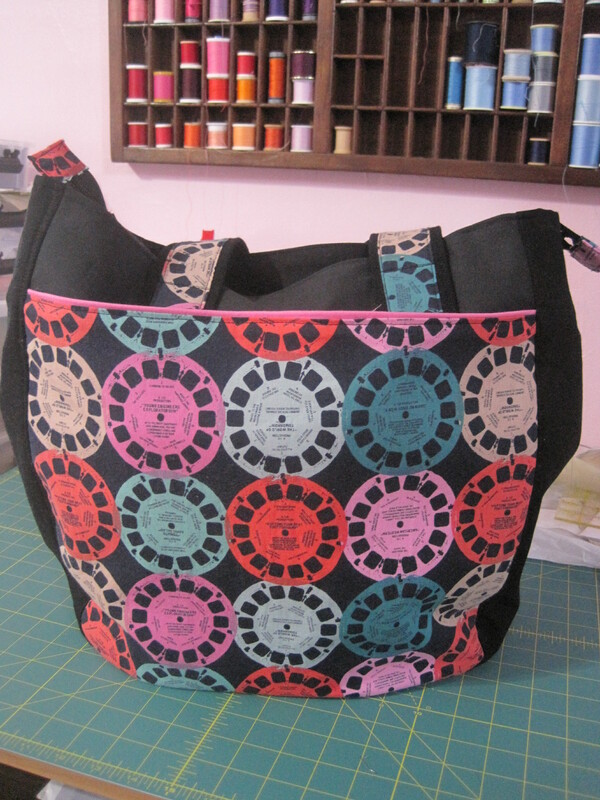 so, this is a sturdy tote bag pattern with a pleated gusset, an outside slip pocket, fully lined with elasticized divided pockets inside, & a recessed zipper. but i made some changes. i also made the entire bag from fabric & notions i already had in my stash, which was a real challenge because of course i started daydreaming about pink zippers & assorted lining fabrics that i would have had to buy. i also didn’t have all of the interfacings the pattern called for, so i had to improvise a bit. i decided to put pockets on both sides of the exterior, because it was barely any extra work, & it’s not like you can ever have too many pockets! both are lined with self-fabric & trimmed with handmade hot pink piping. the pattern calls for the pocket to be secured with a magnetic snap, but i didn’t have any magnetic snap. 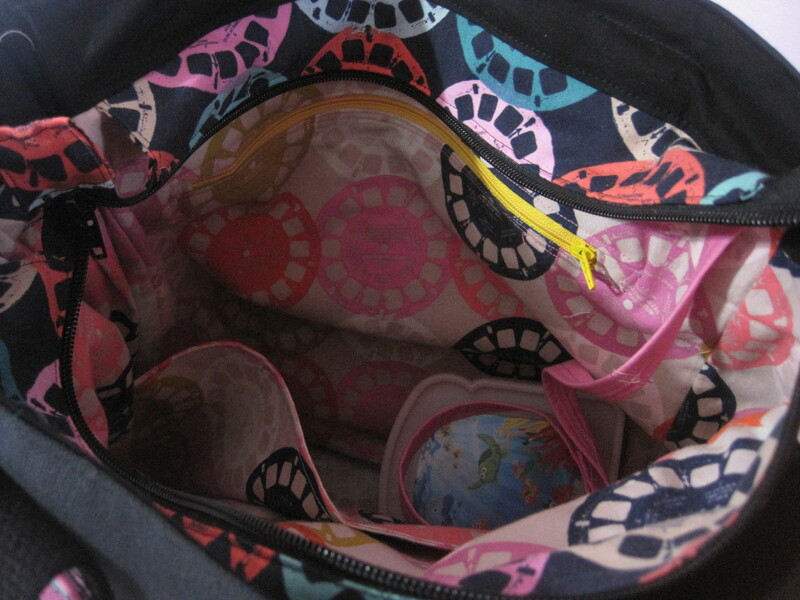 i knew i wanted some kind of closure so the pocket wouldn’t gape open when there was something in it, so i used velcro. that black & white thing is my kindle. the pocket is wide & deep enough for a kindle fire to slip inside with room to spare, & the velcro keeps it nice & secure. i sewed the velcro to the pocket lining before attaching the lining to the exterior so there wouldn’t be any tell-tale stitches on the exterior of the bag. i also added a layer of of pellon 101 fusible interfacing to the pocket for a little extra body. the pattern includes instructions for making the straps out of fabric & interfacing. i was going to do just that when i remembered that i had a length of 2″ wide black woven strapping left over from making a messenger bag last summer. i had 60″, exactly enough! i cut a length of viewfinder fabric, folded in the edges, & topstitched it to the straps as a matching accent. 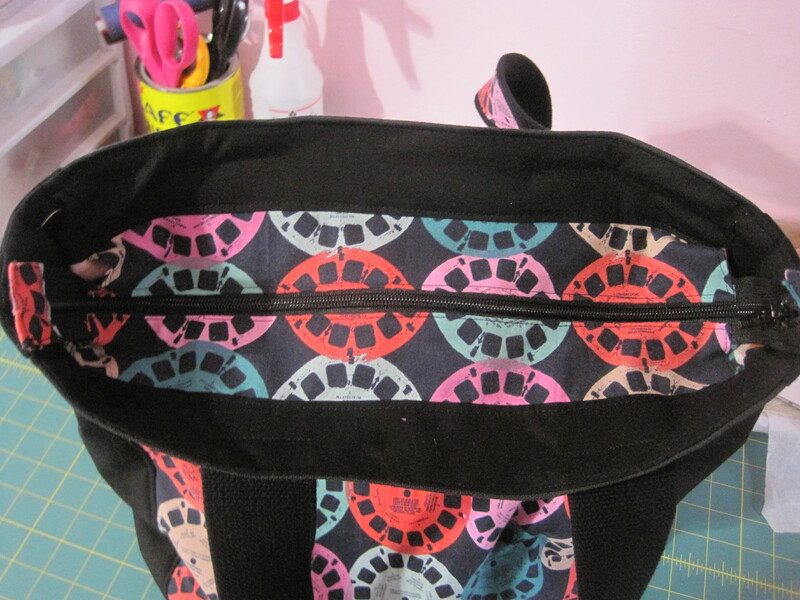 i poked around online to take a look at other people’s supertotes before i cut into my fabric. a few other people used viewfinder prints, & i found myself thinking that the bags that were all viewfinder, on the pocket & the top of the bag, were a little too busy. i decided to use plain black at the top to give the eye a rest. i knew i had some black canvas left over from making that same messenger bag, & i was like, “oh, i’ll make the top & exterior gussets out of that,” hence saving myself a layer of interfacing. (the pattern calls for either home dec/canvas fabric & pellon 101 for the exterior, or quilting cotton interfaced with pellon 101 & pellon 808 craft-fuse.) but i had a lot less canvas than i thought. enough to make the tops, but i had to make the gusset out of black quilting cotton & two layers of interfacing. also, i didn’t have any craft-fuse. i did have a surprising amount of fusible fleece, for some reason. like, more than enough. fusible fleece is floppier than craft-fuse, but…it’s a tote bag. it’s okay if it’s a little floppy, you know? so that’s what i used as my second layer of interfacing. & ps–the finished bag was not at all floppy. it totally holds its shape & stands up straight when i put it down. now, let’s talk about the recessed zipper. this is the alteration i made that i especially like. the pattern has you cut the zipper piece & the interior recessed lining out of your lining fabric. those black parts sticking up are actually part of the interior lining. i didn’t totally understand how this recessed zipper was going to come together, so i cut my lining pieces as instructed at first. i knew i wanted the fabric around the zipper to be my exterior viewfinder print instead of the lining fabric, but i didn’t know how the rest of it was going to go. i am going to try to explain this, & hopefully it won’t be too horribly confusing. so. you sew your zipper pieces to your zipper & set that aside. when you construct your lining, there is a separate piece that is sewn to the lining fabric, & this becomes the “walls” of the recessed zipper. the lining gusset is the same length as the lining plus the walls, & the tops of the gusset become the shorter walls. does that make any sense? anyway, i cut all of this out of my lining fabric as instructed, & when it came time to construct, i realized i did not want those pieces to be made out of lining fabric! my lining was the pink viewfinder colorway & it would have looked awful right next to the navy colorway. so i re-cut the top lining pieces from black fabric, which was an easy swap, & then i cut off the top of the gusset, measured black fabric to replace it, pleated it, & sewed it on to the gusset. it was easy enough to do, but it would also have been easy to accidentally make it not the right size or something. so this way, when my zipper is closed, all you see is the navy viewfinder print & black. i also ditched the elasticized pockets because i just don’t love them. they always bag out & get in the way. i put divided slip pockets on one side (with no interfacing, which i regret) & added a zipper pocket on the other side, using a weird yellow zipper i had laying around. my zipper insertion there was not the best. i had a lot of trouble pressing the fabric layers in place. & i just realized, as i was writing this, that it’s because i didn’t sew it first. oops. i’m an idiot. good thing it’s hidden inside the bag where no one needs to know! i also added a little strap with a clip for my keys, because i lose them all. the. time. i used the same pink fabric that i used for the piping, folded over to hide all the raw edges. i looped one end through the clip & sewed in place, & sewed the other side into the seam where the main lining meets the recessed zipper piece. i made the strap extra long so i don’t have to unclip my keys to unlock the door. i took my bag on its inaugural outing yesterday, to story time at the library & toddler gym. it’s a great size for me, it stays on my shoulder, it comfortably held two library books, my to-do list notebook, my kindle, my camera, my cell phone, & a snack for ramona, & it was easy to use. i love it! That looks great! I want to make myself a new bag, but I’m not sure what to make. I’m thinking either a laptop bag that’s actually big enough to fit my behemoth 17″ work laptop, or a nicer looking duffel bag that will fit in an overhead compartment. Maybe I should make a matching or coordinating set…. (This message brought to you by me having to fly for work using an ugly gym bag and a laptop bag that’s really too small for my laptop. I was so frustrated with both of them). i like making bags. it’s nice to sew something that you don’t have to fit, but still get to take out & show off on a regular basis. i also like that they are challenging enough to be engaging, but simple enough to finish in a couple of days. i kind of wish i had more use for more bags! though ramona has been asking for a new tote bag, so i guess that’s a good excuse for sewing something new.